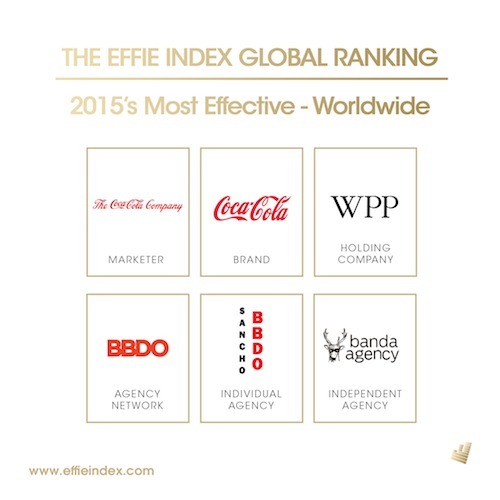 New York (April 8, 2015) — Effie Worldwide has released their global rankings for the most effective marketers, brands, agency holding groups, agency networks, agency offices and independent agencies according to results of the 2015 Effie Effectiveness Index®. The 2015 Effie Effectiveness Index is compiled from 3,136 finalists and winning entries from worldwide Effie Award competitions between January 1, 2014 and December 31, 2014. This is the first time that the Effie Index rankings are calculated using a January-December qualifying period, which will provide marketers with a better understanding of their success over a single calendar year. Previous rankings were tabulated over a June to June eligibility time period. The top five most effective marketers in the world, according to the Effie Index are: The Coca-Cola Company, Unilever, Procter & Gamble, Mondelēz and PepsiCo. The top five most effective brands in the world are: Coca-Cola, Vodafone, McDonald´s, Pepsi and Movistar. Effie Worldwide is a 501 (c)(3) nonprofit organization that stands for effectiveness in marketing communications, spotlighting marketing ideas that work and encouraging thoughtful dialogue about the drivers of marketing effectiveness. The Effie network works with some of the top research and media organizations worldwide to bring its audience relevant and first-class insights into effective marketing strategy. The Effie Awards are known by advertisers and agencies globally as the pre-eminent award in the industry, and recognize any and all forms of marketing communication that contribute to a brand's success. Since 1968, winning an Effie has become a global symbol of achievement. Today, Effie celebrates effectiveness worldwide with the Global Effie, the North America Effie, the Euro Effie, the Middle East / North Africa Effie, the Asia Pacific Effie and more than 40 national Effie programs. For more details, visit www.effie.org. Follow @effieawards on Twitter and on Facebook.com/effieawards for updates on Effie information, programs and news.